Discussion in 'Park Construction' started by roomraider, Nov 12, 2018. First up this is a Six Flags Park that is mainly owned by someone called the Riverside Group. They are licensing the Six Flags name for use rather than Six Flags owning the park itself. The location is near the north end of the Hangzhou Bay Bridge and should be easily doable from Shanghai. 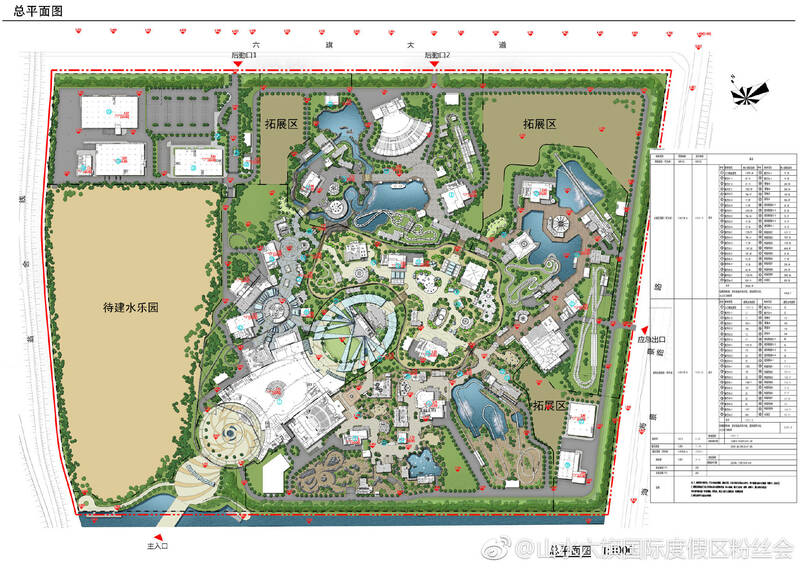 So for the main park there is a fairly detailed Park Plan already available but as with all park plans from China I am always a little sceptical of its accuracy. Here is also a much older plan just for completeness sake. Very similar but lots less detail on and a lots of small changes on the newer one above. Theres a few other possible coasters in there too at the bottom left and to the left of the RMC specifically. The park is also rumoured to get an S&S Free Spin as well which i guess could be at the top there. Shenzhen Renyi may be a new name to many but they are a huge firm in China and are responsible for a lot of coaster construction out there. Steel Dolphin in Shanghai, The Vekoma Firestorm in Hainan and the B&M Wing Coaster at Wanda Wuxi are just some of their ongoing work. And they have always been a reliable source of info over the last few years so I'm as confident as I can be with Chinese stuff about these. The wooden roller coaster is characterized by high, large and steep. After the roller coaster first completes 36.9 meters, that is, a 12 -story climb, the roller coaster will descend at a high vertical angle with a speed of up to 88 kilometers per hour, then pass through a vertical ring of about 34 meters. After the track, complete a butterfly flip and then rush to another tower. I'd take the stats as always with pinch of salt. As much as i trust the firm as with all Chinese things they seem to rarely be spot on with stats for some reason. Confirmed elsewhere there is also a dark ride themed to the weird Tuzki Rabbit coming as well. Make of that what you will. will be the ultimate in high adrenaline, action-packed thrills. From motocross bicycle races along rugged terrain, to whitewater rafting to zip lining or rock climbing hundreds of feet above the ground, guests will have the opportunity to reach beyond their comfort zone and safely push the boundaries of self-discovery in a beautiful, natural environment. There is a previous topic on Chinese Six Flags Parks here but as thats in News its probably best suited to overall announcements on the ALL up coming parks rather than construction. I get the feeling we will be seeing a lot of news coming out of Casa Del Flags in the coming months. Coaster Hipster, b&mfanboy123, EpochEmu and 8 others like this. We'll see how closely they stick to those plans but that RMC looks to be a Goliath clone based on the footprint. 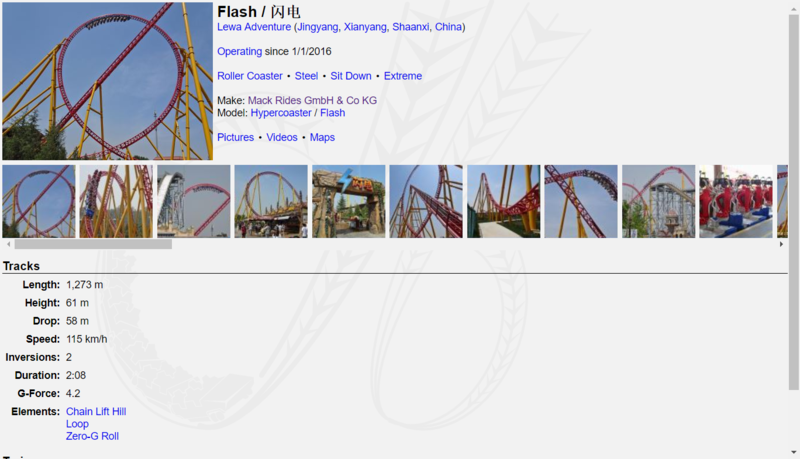 I did not realize Six Flags was planning on making such a splash in China! It'll be interesting to watch this park go up along with the others. Ethan and b&mfanboy123 like this. Six Flags is not "making a splash", they don't own any of these foreign parks or make any Capex. Riverside Group is "making a splash", if yo want to call it that. It's a Six Flags branded park, along with all the others. I'd say they're "making a splash" for sure. I think you've misunderstood the phrase. No didn't misunderstand anything. I perfectly understand the deals. It's a licensing deal. SF is not making a splash! They are still expanding their brand to a new market. Regardless of how much they 'own' the park, or how far they're able to manage it, or how involved the Riverside Group is, they are still helping open a new park with the Six Flags brand to a part of the world they have not touched before. It's not the biggest splash, but they are definitely playing in new waters. By the way, welcome to CoasterForce! Great news this is finally set in motion! As with all things Chinese parks it's always better to stay cautious since many things do (literaly) not go according to plan, but I'm glad the country would get its first taste of RMC goodness Also with the other parks planned, I'm curious to see if increased competition between parks in the same city will change the usual development pattern of "build 2/3 big rides in one place, and then move on to another new park while the first park stagnates" that we've seen with many park chains in China. Technically, Six Flags doesn't own any of their parks anymore. In late stage capitalism, branding is king - customers are going to know the parks by their branding, not by their ownership. You haven't a clue what you're talking about saying SF doesn't own any of their parks anymore. You think your technically BS is sounding smart while just showing complete ignorance. Its absolute BS. Of the 13 dry parks SF had to start 2018 they owned 11. SFOT and SFOG are partnerships where corporate has accumulate units, they have majority units in one of those parks and are accumulating units in both over time. The 2 dry parks and 3 water parks that people keep saying they bought are actually operating lease deals. SF doesn't own anything, they are owned by EPR still. Ethan and Lofty like this. Sigh can we just say the Six Flags brand is making a splash in China. This argument is pointless. Disney dont own Tokyo Disneyland but everyone still calls it a Disney park. Although the coasters are mostly inaccurate this image quite nicely shows how one of the main coasters will wrap around the parks entrance area. Something that should look rather good. The park of course will have an on site hotel just out front. And heres a nice shot of the already complete visitors center which as usual in China has a model of the development within. peep, Matt N, Pokemaniac and 2 others like this. Never mind the children, what about us? Also love the idea of a Tuzki Rabbit dark ride. Takes me back to my Windows Live Messenger days. I often feel like this in China. Hope it gets a scene. So... Shenzhen Renyi Installation Engineering a huge construction company in China who have built many many big rides in China recently (Intamins, Steel Dolphin in Shanghai all of Fantawilds Vekomas, Many of the Happy Valley B&Ms) has posted the ride stats for several rides heading to this Six Flags Park. Which makes some of my guesstimates in the first post very wrong. First off the easy ones. Other rides mentioned include a Whitewater rapids ride, Mack Splash Battle, 123m Funtime Starflyer, Vekoma Mad House, Zamperla Magic Bikes and a Zamperla Truck Off Road Adventure car ride. Coaster Hipster, Matt N and Pear like this. Huh, a Mack Hyper. The stats line up pretty closely to Flash at Lewa Adventure, I wonder if this will lead to more Macks being built over here in the US. Another Flash clone... I'm not complaining tbh. We need more Mack hypers in the world. It's not a Flash clone. This ride has a shorter height and isn't even a hyper like Flash is. Oh, cause a 61m drop isn't 200.1ft. I'd actually say that ATI has it correct tbh and the information has been reversed by accident. This has a drop of 61m and a height of 57m whereas Flash has a height of 61m and a drop of 47m. It seems like they may have got their info mixed up tbh. The speeds match exact, too. Simple research shows that Flash's height is 61m and it's drop is 58m. Wouldn't be surprised if they got the drop and height stats mixed up on this though and it does end up being a Flash clone. The speed converted to m/s matches up as well. I wish the States could get a MACK hyper... Dollywood comes to mind. Please, Dollywood, please get a MACK hyper! Imagine how amazing that 1-2 punch would be!